Have you ever wondered why Lord Krishna always have a beautiful peacock feather in his crown? It is not just for the sake of beauty alone. Here is a popular legend from the Hindu Mythology about this. One day, when the young Krishna was taking care of the cows along with his cowherd friends. Soon all his friends slept because of tiredness. When the evening came, Lord Krishna decided to wake them all, so that they could return to Gokulam on time. 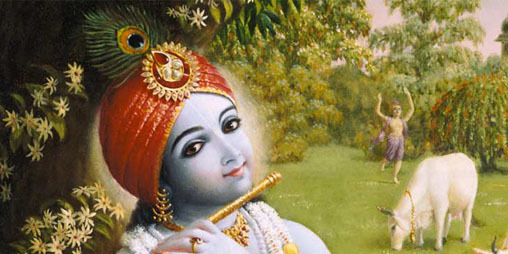 Lord Krishna took his flute and played a melodious tune from that. The music from the flute was very magical to hear. Soon his friends all woke-up and started dancing for the music. Not just the boys, even some peacocks from the nearby Govaradhan hills heard that wonderful music and joined the dance. All of them were dancing and rejoicing with joy because of the wonderful music that was coming from the flute. The music and dance continued for a long duration. It was a bliss to hear that music and see the peacocks dancing with excitement for that music. When the dance was over, the king of the peacocks came forward and touched Sri Krishna's feet to thank him for the wonderful music. He also offered a beautiful feather from his body to Lord Krishna. In those days, the feathers of peacock were considered inauspicious. One of the friends told this to Sri Krishna. Sri Krishna smiled on hearing this. He immediately, kept that peacock feather in his crown and said, "There isn't anything inauspicious in this universe. From today, I will always be having this peacock feather with me." Thus Lord Krishna always have a beautiful peacock feather in his crown.